Born in Indianapolis, Indiana, in 1938, Ryker can recall wanting to play tuba from the age of 5, but says he had to wait until he grew a bit to handle the large instrument. His father was an insurance salesman who moved the family from city to city, while climbing the corporate ladder. Ryker changed schools many times, attending five different high schools over a four-year period. Music provided him with an anchor. He played tuba well and was always welcomed into the school band wherever he landed. In Minneapolis, he started his own band at the age of 12. “I was playing in six bands and going to school and having a great time,” he says. Then he moved again to a new small school that had no band at all. So he joined the school chorus. After that he studied at Indiana University in Bloomington, where he pondered his future career after graduation. Although he loved the tuba, Ryker didn’t want to play it for the rest of his life. When he reached the age of 35, he left Montreal to study conducting at the Peabody conservatory of music in Baltimore. After receiving his doctorate, he conducted the Calcutta Symphony Orchestra and a few small orchestras in Canada. 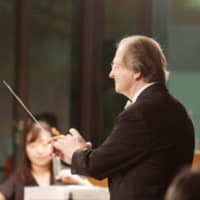 Ryker moved to Tokyo in 1981, where he was invited to conduct as a guest of the Japan Philharmonic, Tokyo Metropolitan Symphony, Tokyo Philharmonic and several other orchestras. However, the maestro, who’s now 80, made his biggest mark after founding Tokyo Sinfonia in 2006. Eight orchestras dominate Tokyo, including the NHK Symphony, Tokyo Symphony, Tokyo Philharmonic and Yomiuri Nippon Symphony. Each typically has between 70 and 110 musicians. NHK, one of the largest in the world, fields 113 musicians and a multibillion-yen annual budget. In contrast, the Tokyo Sinfonia comprises 19 musicians. It can’t compete, sound-wise, with a large symphony orchestra. Thus the maestro came up with the idea to reorchestrate the works of the great masters. Rescoring expanded Tokyo Sinfonia’s repertoire and made the music more interactive and engaging. Now he reorchestrates every program so that each musician has a separate part to play. Sometimes it doesn’t take long to rescore. Other times, like when rescoring works by Brahms, it takes months. “It’s given us an orchestra texture that is unique and access to a repertoire that is unending,” he says. Ryker is musically talented, but admits his limits, saying, “I am not as creative as Mozart or Brahms.” However, he strongly believes himself re-creative, having rescored more than 500 compositions. “They are real works of art,” he says. Small orchestras typically play only a limited and older repertoire comprising some Haydn, Mozart, a bit of Tchaikovsky, and Dvorak to a more narrow audience of classical music fans. To understand why, consider the music scene back in Mozart’s day. During the Baroque and Classical periods, orchestras were small. Beethoven’s Piano Concerto No. 2 was first played with five first violins — the same number as in the Tokyo Sinfonia. Brahms’s orchestra in Detmold had six first violins. “That was the size of an orchestra in that period,” Ryker says. Musicians at the time were often valets working in the employ of wealthy families. For instance, Haydn worked for Count Esterhazy, who liked music and gave the Austrian musician free reign to compose however he liked. When the count would entertain in the evenings, some valets would switch hats to play background music. On special occasions the count might ask his court Kapellmeister, today’s equivalent of a music director, to produce a small opera. Gradually, operas and orchestras got bigger and bigger. Instruments also became more complex through technological innovation. For example, the horn evolved from instruments constructed of simple tubes to those with newly invented valves. The development was akin to introducing computer graphics into cinematography. Composers of the day began drafting more complex scores to match larger orchestras, which grew as opera became increasingly popular. Mahler’s Symphony No. 8, comprising 1,000 choral performers, is an extreme example and is not often performed as composed for obvious reasons. In fact, most compositions are rarely, if ever, played for another reason. “Big orchestras don’t take chances,” Ryker says. Perhaps only 30 or 40 of Mozart’s 800 or so compositions form part of the normal repertoire of the majority of orchestras around the world, for example. The Tokyo Sinfonia caters to three distinct concert audiences. At one end are easy-to-digest dinner concerts intended for couples and friends out for a relaxing evening. At the other end, a more complex repertoire appeals to the most discerning musical palettes. Special guests perform for audiences that lie somewhere in between. The dinner shows are made up of what you might call “nonthreatening” evenings of music served over a relaxed three-course meal, and themed to match the composers’ nationality. “Nonthreatening” doesn’t always mean “popular pieces” the audience already knows; they can also be lesser-known pieces that Ryker feels have an intrinsic beauty. Italian cuisine might be served while listening to Italian composers such as Puccini, Rossini and Paganini. The evening is served up in three segments. A teaser accompanies the aperitif, a meatier piece adjoins the entree and a lighter score winds up the evening over dessert. The maestro serves up his own musical commentary prior to a piece’s performance at every concert. He also encourages orchestra members to meet the audience after performances over a glass of champagne or juice. Even Ryker’s wife, Mari, administrates the orchestra. You can always catch her at reception wearing a smile. Richard Solomon is an author, publisher and spokesman on contemporary Japan. He posts regular Beacon Reports at www.beaconreports.net. Mozart didn’t have the option of many good musicians back in his day, so he positioned his best violinists prominently to his left in the first violin section, which played the main melody in his pieces. He seated the less important second violins just inside them, also to his left but further away from the audience. A similar tradition prevails at large concert halls like NHK’s, where the second violins still play in the shadow of the firsts. 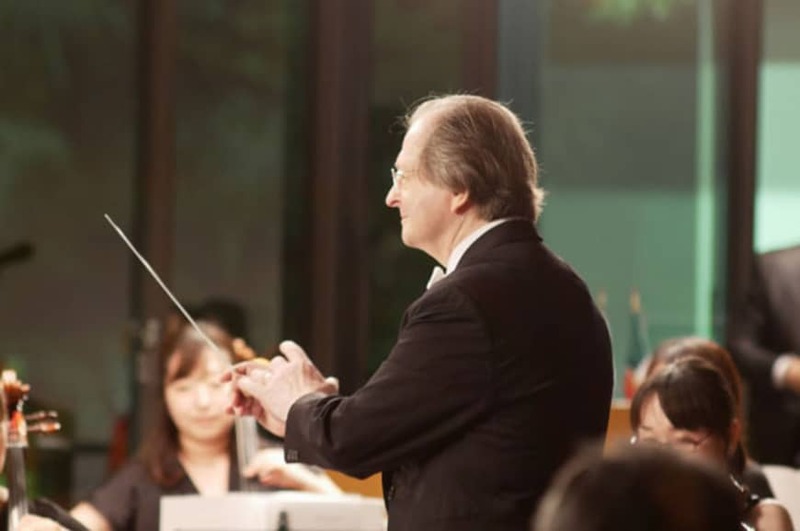 Conductor Robert Ryker has broken with this tradition to get what he believes is the best sound from the Tokyo Sinfonia’s 19 musicians by positioning the first violins to his left and the second to his right. That way the parts they play can each be distinctly heard by his audience. He also rotates violinists between the two sections, with each sitting, on occasion, in the principal’s chair in order to experience being a section leader. Why an orchestra of 19? The violins within each section producing the all important melody each require a minimum of 5 instruments to make a rich melodious sound. Technically speaking, the human ear can differentiate between closely-spaced individual instruments, up to a point. Audiences can hear the difference between three and four violins or four and five violins, for example. But they are are not readily able to distinguish between larger numbers, within each section. To ensure the concert experience both sounds rich and remains affordable, Tokyo Sinfonia features five violins in the first violin section, five in the second violin section, four violas, three cellos and a pair of contrabasses.